Be ready at your hotel lobby at 8:10 p.m, our tour guide and driver will meet and pick you up for a short transfer to Hanoi Station to take the overnight train to Lao Cai City. Overnight on the train. Your train arrrives in Lao Cai around 06:30 A.M, then we take an hour on the car for a transfer to Sapa where we will fresh up and have breakfast. Departure from the hotel at 09.00 am for a short road transfer out of Sapa town to walking path. Then we start to walk along a large path for 2 hours uphill the Den Thang range. Reaching to the top, great view of the Fansipan Peak and the stunning Muong Hoa Valley opens wide in the sight as the trek approaching to Hang Da Village of the H’mong which sits at 1,800m hill-top and over looking down the Muong Hoa Valley. Explore the village and then lunch break. For almost an hour after lunch, the walking path sneaks on high elevation and offers amazing panorama of Muong Hoa Valley. 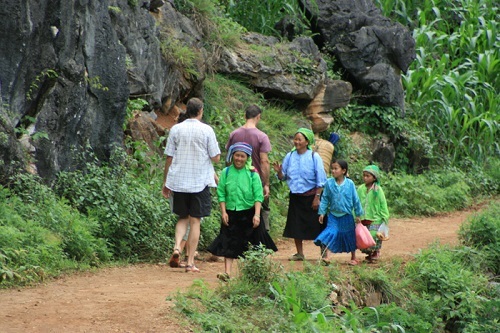 Then getting downhill through several H’mong hamlets of the Hau Thao Commune which scatter on steep and rocky mountain side. There are chances to see different process making fiber from hemp: Spinning, weaving,…in these hamlets.The walk end at Red DzaoVillage of the Giang Ta Chai Village in the late afternoon. Checking the home stay, you can swim at the Muong Hoa Stream or Ta Chai Waterfall as well as walking on Rattan Bridge to have adventure feeling. Having dinner and sleeping with the local tribe. After having breakfast, we will walk uphill via Bamboo forest to visit Ta Va Village, home to Red Dzao Tribe, continue to walk along the Muong Hoa Valley with billions of rice paddy fields to visit Lao Chai Village, having lunch there before climbing to the main road for a transfer back to Sapa. The rest of afteroon, you are free to your leisure. • 04:00 P.M, arriving in Dong Van Town, check in the hotel then you are free at your leisure. • 09:30 A.M, we check out the hotel then have a car trip up to the top of the Ma Pi Leng Pass, through a gigantic maze of lime peaks, “stone forests”, and canyons unique in the world. We then go down into the valley of Meo Vac, We then continue snaking through the mountains, cross the river, and arrive in the village of Bao Lac, where you can have lunch at the local restaurant in your own. • 09:30 A.M, we start to explore Ba Be Lake, the caves of Puong Grotto, the rapids of the Dau Dang waterfall and tiny Widow Island. You will also visit the stilt houses of the Tay community in Bo Lu Village, where you will spend the night in a homestay. • 09:00 A.M, visit some lovely villages and hike the upper reaches of the lake, in an area marked by massive limestone cliffs and mountains. Time for visiting Hua Ma cave, the biggest dry cave in Northeast Vietnam. • 03:30 P.M, arriving in Hanoi, ends our tour by dropping you off at your hotel. Pack essentials, including light comfortable clothes suitable for outdoor activities, hiking shoes and small day pack, warm clothes in the winter time (from November to March).